We can help plan your next event from table selection and sizing to decorations and food presentation. We can be as involved as you need in creating your next special event. Event and festival management includes tents, pop ups, tables, chairs, linens, staging, barricades, generators, portable toilets, trash boxes and even clean up. If involved early enough, we can order and coordinate all aspects of operations. Set up and take down is scheduled to lessen street closings. We manage all city/municipal permits including tent, electrical, parade, assembly, etc. We have contacts in the area of audio visual services. We install tents on lawns as well as patios and driveways. Rain gutters, adjustable legs and other accessories allow unlimited configurations. Side curtains, heaters, fans and lighting are also available. Prices start as low as $295. 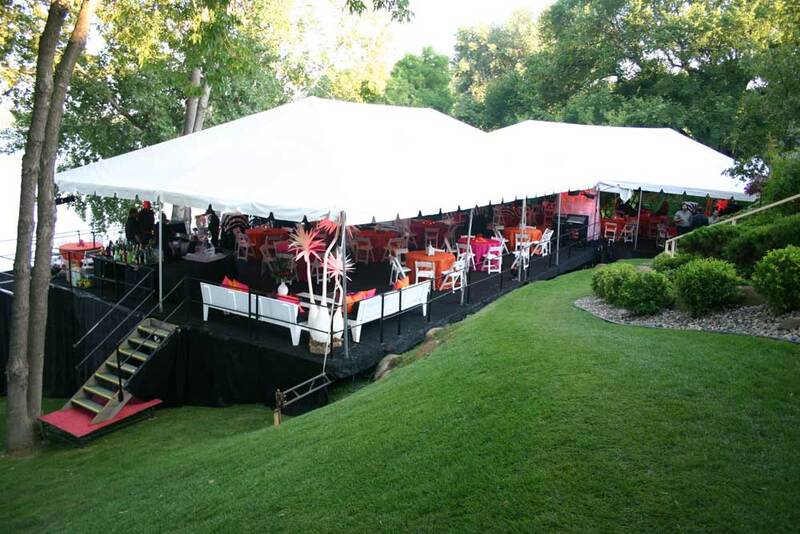 Click for more about tent and canopy rentals. We have everything you need for the perfect wedding package, including wedding red carpet runners, candelabras, wishing wells, dance floors and more. We have a wide variety of decorations and furnishings for all kinds of special events! Includes portable bars, house guest cots & cribs, conference equipment, dance floor areas and more. We have a wide selection of tables, seating and linens for your next event. Learn more about table, seating and linen rentals. We have a wide variety of china & glassware to suit the needs of any party! Includes several choices of color/shape, barware, flatware and more. Read more about china, glassware and centerpiece rentals. We supply catering equipment to suit the needs of any party! We have serveware, chafing dishes, specialty displays, popcorn and hot dog machines, coffee and punch service and much more available to rent. Contact us for a consultation regarding your indoor or outdoor holiday and event lighting.